7 July, 1944. 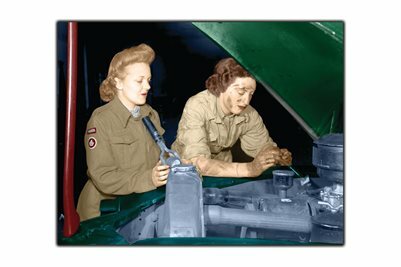 Private Helen Brymer looks on as Private Dorothy Lowry works on a vehicle at Chelsea & Cricklewood garage, England. Both women served as volunteers in the Canadian Women's Army Corps (C.W.A.C.). The C.W.A.C. began as Canadian Women's Auxiliary Corps, and initially, was not appreciated by senior army officers. But the "petticoat army" soon proved it worth and usefulness. The women did every job in the army except combat. They were radio operators, canteen workers, mechanics for every type of vehicle, office support staff, and much more. The C.W.A.C., and sister organizations in the Air Force (RCAF Women's Division) and Navy (WRCNS) gave nearly 50 000 Canadian women an opportunity to serve as part of the military. Recognition of their valuable contribution to the war effort paved the way for future women to serve in expanded capacities, and eventually, full integration into all military roles.